Patek Philippe has been the brand of choice for discerning collectors and human beings since its founding in 1839. Though modern times and circumstances have created a great deal of competition for the venerable Genevan manufacture, its reputation remains unmarred and its position at the top of the horological pyramid is still undisputed. There is no more tangible proof of this fact than the stunning Patek Philippe Museum in Geneva with its untold treasures hailing from the realms of horological history, a veritable monument to the ingenuity of watchmaking expertise. The museum is also a monument to the brand and the house of Patek Philippe itself, for few, if any, other companies would have the desire, the power, and the means to gather so many pieces of this magnitude into one private collection. Capitalizing on this vast history of exceptional products and know-how gathered, Patek Philippe has decided to do something extraordinary: create one of the most comprehensive temporary horological exhibitions ever to be shown in the United States. “The Art of Watches Grand Exhibition” is set to take place at Cipriani 42nd Street in New York City from July 13 through 23, 2017 within a two-story structure inside the venue. Visitors to the eleven-day exhibition will see exceptional examples of horology, with one piece dating all the way back to 1530. Entry to the “The Art of Watches Grand Exhibition” is free of charge for the general public. As a matter of fact, it was in early 1855 that Antoine Norbert de Patek first traveled to the United States, where he was able to win the illustrious firm Tiffany, Young & Ellis as Patek, Philippe & Co.’s first official agent in the new world. The Grand Exhibition will feature ten thematic rooms that include the Napoleon Room, the Watchmaker’s Room, the Movement Room, the Theater Room, the Current Collection Room, the Museum Room, the Interactive Room, the Grand Complications Room, the U.S. Historic Room, and the Rare Handcrafts Gallery. The Rare Handcrafts Gallery has especially piqued my interest. According to Patek Philippe, this space will feature artisans demonstrating various techniques used to decorate the brand’s special timepieces and Dome Clocks. Also on display will be limited edition, rare, handcrafted pieces created for the Grand Exhibition and the U.S. market featuring American themes. As one of the most traditional brands with very deep roots in Geneva’s horological heritage, it is only natural that Patek Philippe has a strong affinity for related forms of craftsmanship that have accompanied and embellished high-quality timepieces through the years. Patek Philippe has spared neither cost nor effort to preserve artisanal legacies that were seriously in danger of becoming extinct during the so-called quartz crisis. This led to Patek Philippe continuing to commission work from highly skilled and specialized individual craftspeople even during times when the brand was unable to sell them immediately. Today, there is no danger of this happening; at present such timepieces are almost always sold before they’re even completed as each one is a unique work of art. Let’s take a look at a couple of the types of artisanal techniques that Patek Philippe offers. 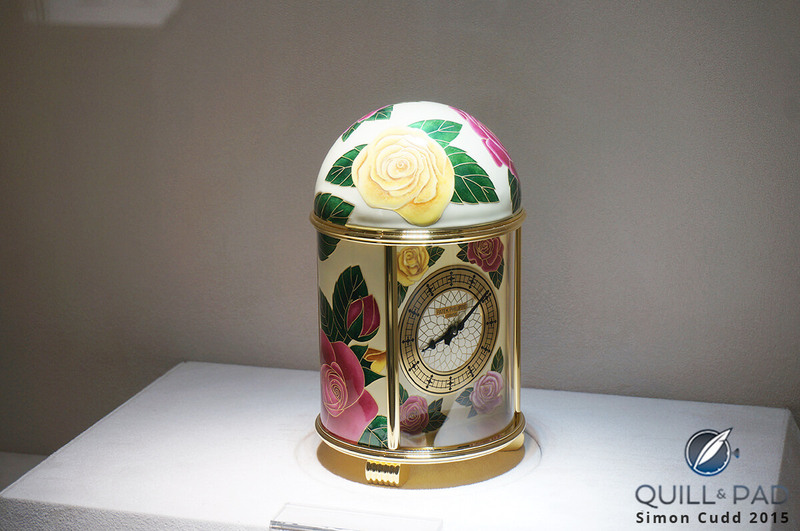 Geneva is particularly famous for the tiny, painstakingly reproduced paintings that are applied to the miniature canvases that the dials of pocket and wristwatches represent here. These detail-rich miniscule works of art developed thanks to the horology and performed more or less in the second half of the seventeenth century. The combination of the two art forms, not so dissimilar in terms of scale and patience needed, propelled the popularity of Geneva as an artful, horological center. Dawn on the Lake (above), created by Anita Porchet for Patek Philippe’s 175th anniversary, is an exquisite example of modern Geneva-style miniature painting. These delicate portraits and reproductions of great masters necessitate countless hours of detailed work. Added to the difficulties that the art of enameling brings with it – where any misstep of human hand or fiery kiln means beginning all over again – is the sheer scale. To reach the depth great of good enameling, numerous steps are needed. Each layer comprising miniscule applications, some with a one-haired brush, must be fired at 850° C before the next layer or color can be applied. Typically, the artisan’s brush is composed of one single badger or marten hair. A perfectly executed miniature enamel painting can take up to two months of very delicate and risk-taking craft. Only a small number of pieces leave any Geneva workshop each year. The ingenious world time wristwatch that Patek Philippe patented in 1959, whose complicated mechanics are based on an invention by Louis Cottier (1894-1966), is famous for one other element: the intricately and beautifully enameled dials featuring a cloisonné map of the world crowning the movement. The difficult cloisonné technique is the primary one used to create these complicated dials. It involves tracing the outlines of a scene’s figures or forms by separating the colored fields with miniscule gold threads smaller in diameter than a hair. This type of enameling is also prevalent on Patek Philippe’s Dome Clocks, which the company has been making for more than half a century. Combining the infinitesimally small diameters of the gold wire with the challenges of the enamel itself is an art form only few have mastered. A great enameler must be both artist and alchemist as each color has special characteristics that require advance judgment as to what will happen under the extreme conditions of the kiln. If too much heat is applied, the artisan’s color mixture becomes worthless; too little, and it will not achieve perfect flow and translucency. Some colors demand separate firings, while others can only be fired in certain combinations. The champlevé enamel technique calls for a comparatively thick metal base to be first worked over by an engraver. While this sounds mysterious, it’s not: the engraver needs to add cavities or recesses to the base metal in the desired shape. Then, enamel is put into the prepared grooves to form shapes, thus creating concrete forms. After that, the enamel is fired and sanded after leaving the kiln and cooling, whereby excess material is removed to give it an extra shine. One important element that makes enameling so difficult to master is the fact that the artist must mix his or her powder agents in just the right way so that they fire evenly in the kiln without splattering. This happens when too much water has been added to the powder and it begins to boil. If the paste is too dry, it will not stay on the surface for which it was intended. Enamel must be fired many times to achieve its incredible richness of depth and stability, which is its main advantage over simply painting. As many as fifteen individual layers of enamel are required to create the appropriate visual depth, and each is fired separately. Obviously, each firing increases risk of damage or burning in the kiln. Only many years of experience can bring perfect results and even then, the finesse required is so delicate that pieces are often ruined because of conditions outside of the enameller’s control, such as small differences in the composition of the metal oxides. Perfect pieces are all the more valuable. Engraving may not be an art that is fundamental to high horology, but without it the mechanics might can seem cold and lifeless as the earth the metal it was mined from. Oftentimes, dials and cases of Patek Philippe’s pocket and wristwatches are embellished using a graver tool, and once in a while – as with a skeletonized masterpiece – the movement is also treated to beautiful engraving. The engraved line is a simple, universal mode of ornamentation, and the intaglio style of engraving it is incised directly onto the surface of the chosen metal by hand using various instruments such as the graver, the burin and the drypoint to name just a few. When added to the light and airy mechanics of a skeletonized movement, it becomes a masterpiece. It’s worth pointing out a couple of the exhibits in the Rare Handcrafts Gallery, which are being brought to New York City from the Patek Philippe Museum in Geneva for the eleven-day extravaganza. Only twelve years after Patek Philippe’s founding, the Geneva-based brand was already supplying watches to Queen Victoria and her consort. By choosing the manufacture founded scant years before, the queen established the Genevan company as the place to buy watches for all the royal courts of Europe. Queen Victoria bought the timepiece no. 4719 shown above during the Great Exhibition of London that took place in Hyde Park’s Crystal Palace in 1851. Wound by key, it is powered by a gilt LeCoultre & Cie. ébauche with cylinder escapement. The queen more than likely wore this timepiece hanging from a pin, ribbon, or other decorative element on her clothing or hanging from her waist as well-bred women of the day often tended to do. The 42.5 x 30.5 mm case in yellow gold, diamonds, and enamel housed that ensured that the hours and minutes displayed on the enamel dial using blued steel Breguet-style hands were attractive enough for a queen. The timepiece shown above was definitively worn pinned to Queen Victoria’s clothing as evidenced by the diamond and enamel brooch from which it is suspended. This yellow gold timepiece, whose Breguet-style hands simply show the hours and minutes in a clean, crisp manner, was also acquired by the queen during the Great Exhibition of London, which was organized by her husband and consort, Prince Albert, who also had the Crystal Palace built to house it. In 1851, Antoine Norbert de Patek established a partnership with Tiffany & Co. in New York City; the pendant watch pictured above was delivered to the retailer on December 31, 1852. Its front cover is enameled in translucent blue against a background of guilloché in an art form called flinqué. The 54.7 x 38.4 mm yellow gold pocket watch’s front cover also features 28 six-pointed stars, each set with a rose-cut diamond surrounding a large eight-pointed star set with nine rose-cut diamonds. The back cover features 32 six-pointed stars, each set with a rose-cut diamond. This timepiece no. 4740 is powered by a gilt Aubert Frères ébauche with cylinder escapement. For more information on the Patek Philippe ‘The Art of Watches Grand Exhibition,” please visit www.patek.com/en/communication/news/the-art-of-watches-grand-exhibition-new-york-2017. You may also enjoy Dawn On The Lake: Celebrating Patek Philippe’s Grandiose 175th Anniversary With Art And Collaboration. Can’t wait to see it! Looking forward to interacting with the team bringing this valuable exhibit to the US. Hope some of them will come to visit the NAWCC.org collection in Columbia, PA.
Looks *almost* as good as the London version! Unfortunately, I did not get a chance to go to the London exhibition, so I am doubly excited by the New York edition. I am also certain there will be historical pieces by other watchmakers from the Patek Philippe Museum in New York as well.